Audi E-Tron Spyder review | What Car? What is it? This is the latest in a line of Audi E-Tron concept cars. This one is a plug-in hybrid, with a twin-turbo diesel engine that drives the rear wheels and two electric motors driving the front wheels. Its as wide as an R8, but significantly shorter, has an aluminium spaceframe structure and carbonfibre bodywork. Audi quotes an average 128mpg and CO2 emissions of 59g/km. A production version hasnt been confirmed, but the E-Tron Spyder gives an insight into the styling and technology of future Audi production models. Whats it like to drive? Its immediately obvious that this is a concept car, with a few rough edges and bodywork that creaks over bumps. Audi engineers say a possible production version would have a different cooling system and suspension parts; it would also have an S-Tronic semi-auto gearbox, rather than our cars continuously variable transmission (CVT). The limitations of the CVT 'box (installed due space constraints until Audi engineers can find a solution) meant that the car we drove wasnt as powerful as it should be, either. Normally, the mid-mounted 3.0-litre twin-turbo diesel engine should be good for 309bhp and 479lb ft of torque, but that was restricted to 280lb/ft. The two 43bhp electric motors which drive each of the front wheels were at full capacity, though, providing 260 lb/ft of torque the moment you put your foot down. Initial acceleration was pretty brisk, and there was a noticeable shove in the back when the diesel engine kicks in. With the right gearbox and maximum torque available, Audis claimed 0-62mph time of 4.4 seconds seems reasonable. Currently the absence of any soundproofing makes the E-Tron Spyder fairly noisy. The whine from the electric motor isnt loud, but the whooshing and whirring from the diesel engines turbochargers, intercoolers and cooling system behind your head is; at the moment, the E-Tron Spyder doesnt sound especially sporty. Our short drive wasnt enough to reach a definitive verdict on the E-Tron Spyders sportscar credentials, but suggested that it feels reasonably nimble and turns quickly in to corners. The steering is light and short of feel, though. The ride is firm, partly due to 20-inch alloy wheels and low-profile tyres that are geared more towards show car looks than ride quality. With such exotic styling its easy to overlook the E-Tron Spyders eco-friendly nature. Its able to run for 31km on electric power alone, at speeds of up to 19mph. A production version of this powertrain would be able to do the same at up to 62mph, Audi says. Whats it like inside? Stunning. The simple, futuristic design looks great and the materials including lots of leather, aluminium and carbonfibre are classy. Apart from a few details and a glovebox stuffed with a makeshift panel of switches it looks almost production ready. The wraparound windscreen certainly isnt - despite Audi engineers best efforts to produce it in glass, the car currently has a thick plastic version that gives a distorted view out. When can I buy one? You cant. Not in this form, at least. That said, a new sports car - possibly called R4 - that will fit between the TT and R8 in the Audi range is likely. Audi is remaining tight-lipped, but wed be surprised if it didnt appear within the next two years, with styling and technology strongly influenced by its E-Tron concept cars. 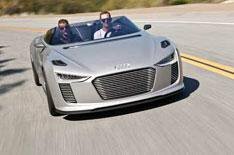 Audi engineers admitted to us that a plug-in hybrid model is due in 2014, although it wouldnt confirm whether that would be a sports car, or whether it would use the same powertrain as the E-Tron Spyder. A production version of the R8 E-Tron has been confirmed, though. It will be launched at the end of 2012 and is likely to change little from the concept car that was unveiled at the Frankfurt motor show in 2009. Itll be powered by four electric motors one for each wheel for a total output of 313bhp. Itll be priced above the current R8 V8 models, so is likely to cost more than 100,000.